It’s been three years since Idle FC was established and we’ve certainly gone from strength to strength during those first, formative seasons. Born with the vision of bringing friends and local players together in a competitive and fun environment, Idle have created what we like to think is a welcoming, family club embedded within the local community. What began as something of a pipe dream 3 years ago achieved its first notable success as we marched convincingly to the Yorkshire Amateur League Division 2 title in 2016/17, demonstrating just how far the club has come in a short period of time. After spending two seasons in the Spen Valley League, it was time for a change of scenery and a well organised league which would offer a competitive test. The Yorkshire Amateur League was our destination and the season started well with Idle storming to an opening-day, 1-6 victory Colton Athletic. Easy this football lark! The first three games saw Idle rack-up maximum points which did wonders to raise the confidence of the lads. The squad did suffer a few setbacks after injuries and absences lead to the first losses of the season, firstly going down 3-2 at home to Ealandians Reserves. It was a loss that prompted a bit of a mid-season slump in form with losses to Colton in the return league fixture and Fairbank United in the cup, after what can only be described as the worst back-pass of the season from Jamie Allen! It was Gerrard to Henry-esque through ball. It was essential to bounce back quickly from our first defeats and a 2-4 victory over Collegians in January was the perfect response. Idle put in their best performance of the season up to that point against a young and physical side who were leading the league unbeaten until then, competing in every area of the pitch and showing the greater quality in front of goal. This reinforced our belief that we could win trophies and much like Liverpool of the past 20 years, it would be our season! However, complacency was to creep in, throwing away a 0-3 half-time lead at Woodkirk Valley to end the game 4-4. It’s safe to say a few heads rolled off in the dressing room/portacabin (probably the worst changing rooms we saw all season) at full-time, everyone knew that any slip-up would give our rivals a chance to close the gap. This was arguably the catalyst for the season as the whole squad really raised their game from then on! 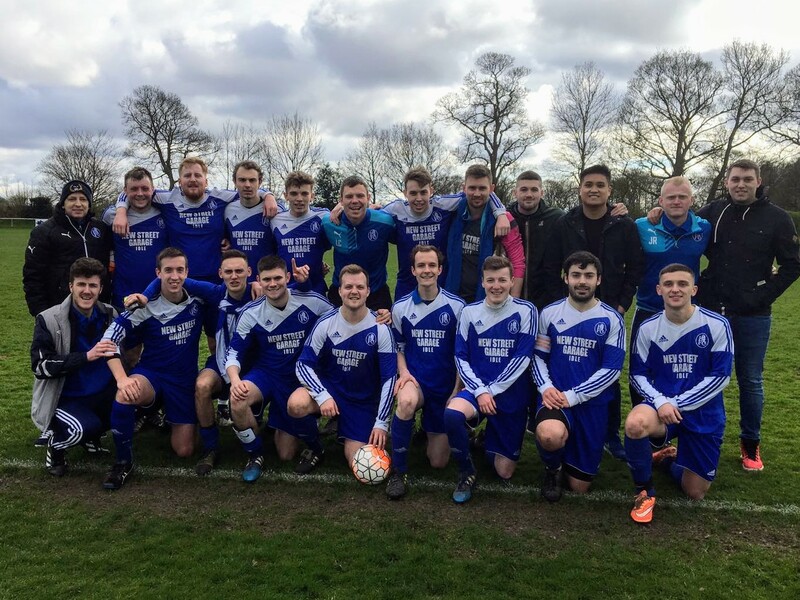 A run of seven straight victories, with key wins over Leeds City Old Boys, Ealandians and the return leg against Collegians effectively secured the Division 2 title. The pressure was on every game from February onwards, with manager Rob Brook and assistant manager, Marcus Strudwick keeping the lads calm ensuring we took it one game at a time. The attacking football was brilliant to watch at times with plenty of passing football on show with devastating pace on the wings. The interplay between Carl Dawson, Tom Simonett, Jack Strudwick, Ryan Mitchell, Adam Medley and Aaron Irving amongst others was of the highest quality with the lads often cutting through opposition defences at will. Despite the fact we’d struggled to field a consistent defence all season, the lads at the back can hold their heads high after conceding the least amount of goals in the league. The best performance coming against a strong Ealandians side who’d drafted in some first-team players for the big match knowing they’d be in for a game. Idle ran out 0-1 victors after 90 minutes of hard work and a determination to battle for every ball which hadn’t been seen in previous seasons. It was a season of solid performances from James Royal, Luke Chandler, Carl Brown, Luke Gray, Ryan Doherty, goalkeeper Stephen Kelsey and others. The sun was shining and the pitch at Adel Sports and Social Club was immaculate, the best we’d played on all season. It was a perfect day for football and it certainly made for a great spectacle with Leeds City coming out all guns blazing, knowing only a win would do for them too. Leeds City started the better team and took a 1-0 lead into half-time which was quickly doubled after the break. However, that’s when the Idle fightback began. Having wrestled control of the game back through hard work and perseverance across the entire team, Idle responded with 2 goals from tenacious striker, Irving to level the game. From here, it was Idle’s game to win. The Leeds City lads seemed to run out of ideas and the momentum shifted in our favour. Simonett capitalised from the goalkeeper spilling a cross to put Idle 2-3 up before a world class lob from the middle of the park by Jack Strudwick sealed a 2-4 victory. Victory was sweet and Idle had secured the Division 2 title against one of the strongest teams in the league. A truly historic moment for the club! Idle finished the season on top of the pile and ahead on the majority of the statistics including Aaron Irving securing the Golden Boot award. A big thank you is due to everyone who has supported us during our first few seasons in existence, including all the players and staff as well as our original sponsors. Our thanks go to Mark Allen of New Street Garage, Mark Drummond of Towngate Fisheries and Pearl Dawson of Sweet Occassions as well as the Football Foundation. Without their support we wouldn’t be where we are today. ← Football is dead, long live football!